The integration of various high-speed sensors and 10GbE+ backbones within the flight test instrumentation (FTI) community has vastly increased data rates, on-board processing requirements, pure network architecture, and cybersecurity requirements. These new high-speed systems often need to record traditional low-speed data such as PCM, 1553, video, analog and discrete signals. Conventional hardware based CH10 recorders are too slow for new programs, have too much latency, and limited processing power. The new requirements for recording high and low speed signals in a usable and protected format has moved the industry towards new FTI technology. 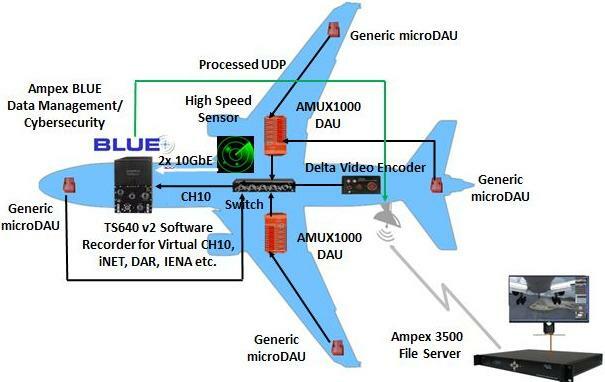 AMPEX is the only avionics company to offer a complete, high-speed, NextGen FTI solution that is designed to combine conventional data and new network requirements in a future proof system with machine learning based data management and cybersecurity options. View larger image. A software recorder – virtual CH10, DAR, IENA, iNET, etc.